Ending another record-breaking year, the Outer Banks Community Foundation announced over $81,000 in grants earlier this month. Over a dozen local nonprofits received support, benefiting every type of charitable cause, from education to historic preservation, to helping the homeless, the sick, and the disabled. This brings the Community Foundation’s total giving to $660,000 in grants and scholarships in 2016, and $7.7 million since its founding in 1982. The Community Foundation awarded seven Community Enrichment Grants last month. These grants are given on a competitive basis to nonprofits that apply for funds. 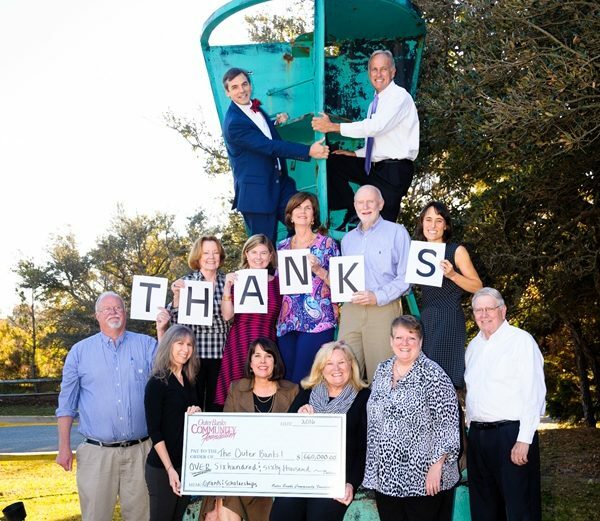 The awards included $8,078 to the Community Care Clinic of Dare for upgrading their electronic health records, $10,000 to the Elizabethan Gardens for the restoration of their historic Great Gates, and $4,825 to OBX Go Far for safe clothing for volunteer coaches and student runners. Two grants were awarded to help build the capacity of two vital, local nonprofits: Mano al Hermano for office equipment, and the Outer Banks Relief Foundation for a campaign planning study. Benefiting Hatteras Island, two Community Enrichment Grants were made to nonprofits for disaster relief: $8,037 to the all-volunteer Hatteras Island Community Emergency Response Team for a storage trailer for equipment, and $10,460 to the Frisco Native American Museum to replace and repair equipment and display cases damaged during Hurricane Matthew. This is in addition to disaster relief provided to families and individuals across Dare County through the Community Foundation’s Disaster Relief Fund, in partnership with Interfaith Community Outreach and Dare County. In addition, five donor-advised funds awarded grants this month, to diverse organizations including the Dare County Arts Council, Room in the Inn, Outer Banks Sporting Events, Roanoke Island Volunteer Fire Department, and Outer Banks SPCA. Donor-advised funds are charitable funds managed on behalf of donors and families who recommend the grants that are awarded. The Outer Banks Giving for Good Giving Circle also awarded grants totaling $6,950 to nonprofits selected by member families. Grant recipients included Surfing for Autism and the Mustang Outreach Program. But while the grant-making in 2016 was impressive, Ms. Costa said there is urgency to do more. “The generosity of this community is astounding, and yet our community needs are still immense,” said Ms. Costa. The Community Foundation is currently raising funds for its Community Fund, its single largest grant-making endowment, as well as the Disaster Relief Fund, which assists individuals and families in need who were hard-hit by Hurricane Matthew. Donations may be made online at www.obcf.org/donate and are fully tax-deductible. Checks may also be mailed to 13 Skyline Road, Southern Shores, NC 27949. 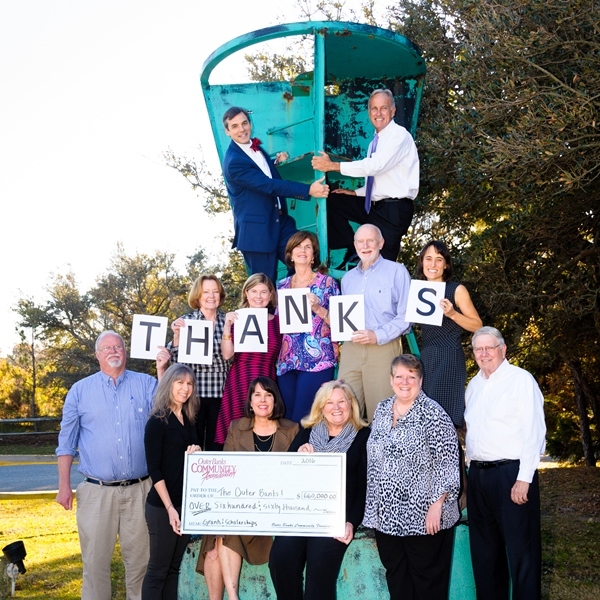 Photo Caption: Board and staff members of the Outer Banks Community Foundation celebrate $660,000 in grants and scholarships. From left to right: Top row: Scott Brown, John Graham; middle row: Jane Webster, Nancy Sugg, Teresa Osborne, Ray White, Lorelei Costa; bottom row: Bob Muller, Leslie Reed, Dorothy Hester, Deloris Harrell, Shirley Hamblet, Chris Seawell. Not pictured: Scott Leggat, Loretta Michael. Photograph by Biff Jennings, Shooters at the Beach. OBCF Thanks Donors to the Disaster Relief Fund Wayne Fulcher Arts Scholarship Announced!